Although the Olympics officially began on August 8, the press was in full swing the week before. From August 3 to 8, 14% of all media coverage was devoted to the Olympics and China. In general, these stories were dominated by Chinese preparations and the opening ceremonies, and sports received comparatively little coverage. The top storyline of the week leading up to the start of the Games focused on the elaborate opening ceremonies (18% of the Olympic and China newshole) and how the Chinese had prepared for the Games (another 18%). This included stories on how China was preparing for a large influx of tourists and how Beijing was going under a significant “makeover” as the games approached. The question of China’s human rights problems came next (13%). Security concerns filled 6% and environmental concerns, largely pertaining to the effect on athletes, 4%. Taken together, those five storylines made up 59% of the Olympic and China coverage. 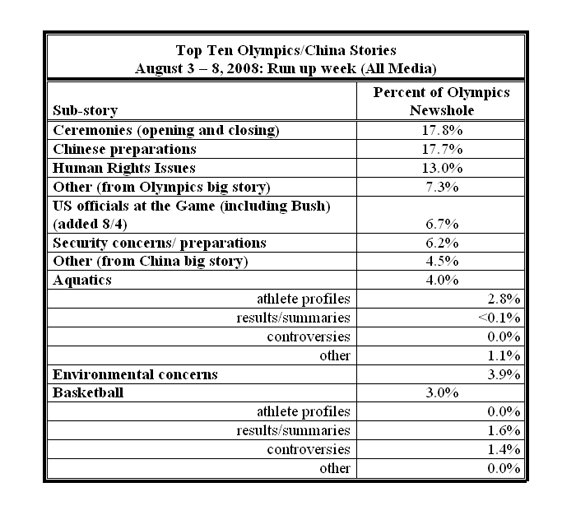 Stories about Chinese trade and business, however, were limited, just a fraction of the Olympics and China coverage (2% of the newshole) as were stories about Chinese politics and government, also just 2%. One storyline that did receive substantial attention was President Bush’s controversial decision to appear at the opening ceremonies. Stories about U.S. officials appearing at the Games made up 7% of the Olympics newshole. President Bush was the lead newsmaker in roughly 15% of Olympics and China stories in the lead-up to the Games, far more than any other individual during that week—including any athlete or Chinese official. Of all the major storylines leading up to the games, only two sports gained any measurable attention, aquatics (swimming and diving) and basketball, and even that was limited to 4% and 3% of the Olympic newshole, respectively.